Thank you for been there with me when i lost my dad. you came to my house warming cermony to bless us. I am extermely sorry i did not touch your holly feet please forgive my sin. I sincencerly pray you to forgive all our sins and show us the path to reach your lotus feet. Thank you for giving me the oppurtunity to express my gratitude through this form. Our Baba Sai will always shower His grace on His beloved devotees. forum and also He has graced you in many forms. to stay in touch with all of us. Sri Prithviji welcome to BABA SAI's Blessed Online Mandir. Don't worry if you couldn't at that time. Now you get many chances whenever you will log into this Online Mandir HE is always THERE. So be regular and have HIS darshan. 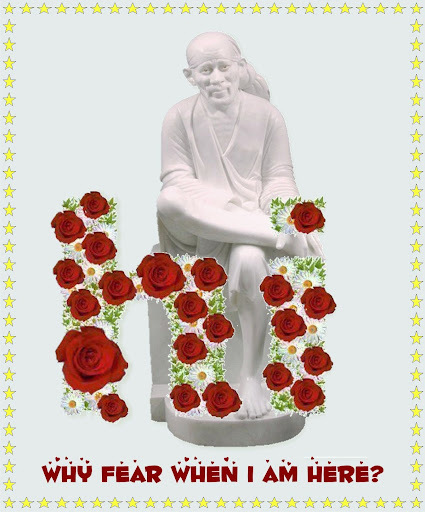 MAY BABA SAI BLESS Sri Prithiviji always. Welcome to this awesome online Mandir.Truly blessed are you to have Sai in your heart.He will continue to remain so and through you he would make his presence felt to all. Welcome to the clessed mandir of Baba. Baba surely reading your post and we belive that all writings are going to Baba directly.